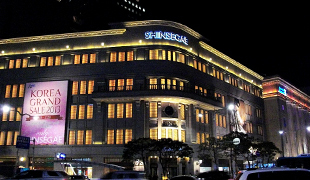 The Shinsegae Department Store adopted the concept of a modern department store in the early 1960s for the first time in Korea and established Korea’s first direct-management system, which marked a turning point for modernizing the distribution network in Korea. 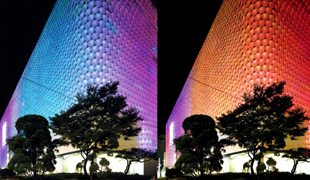 The main shop of Shinsegae Department Store is a symbolic venue that represents the tradition and value of Shinsegae. The main shop has a beautiful, old-fashioned external appearance. It has a variety of stores, ranging from the world’s three major brands to new designers’ products. It suggests a new lifestyle through a cultural space where shopping and culture co-exists in harmony in places such as the Trinity Garden and Art Gallery. 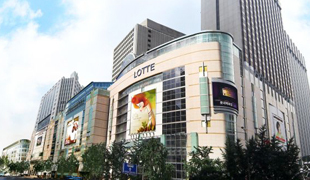 The main shop of the Lotte Department Store in Sogong-dong is Myeongdong’s representative shopping space. It consists of various products, ranging from world famous brands to daily living essentials. Basement s1 and 7 offer currency exchange services for the convenience of customers. Floors 9 and 10 have duty-free stores, which are frequented by many tourists. The department store offers many things to see with its differentiated cultural spaces, such as its gallery. 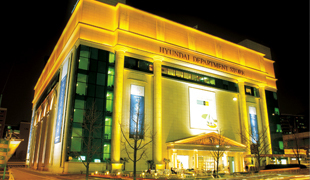 The main shop of Hyundai Department Store is located in Apgujeong-dong, which is the center of Gangnam fashion. It is a shopping space consisting of Korea’s best brand names. Basement 2 is decorated with an interior style and brands that are meant to target young consumers, and floor 2 has famous brand name stores such as Mulberry, Chloe, and Bottega Veneta to target consumers in their 30s. The rooftop sky park is a garden where consumers can enjoy looking at the sky. It has a wide lawn, bamboo trees, and birch trees, which provide a perfect resting place for customers. The Galleria Department Store introduced the concept of a masterpiece store in the 1990s for the first time in Korea. The name “Galleria” has the meaning of an art museum that holds a collection of the world’s most famous works of art. Galleria is divided into two separate buildings, Seogwan (west building) and Donggwan (east building). The west building consists of fashion stores targeting young consumers. This space is for consumers who pursue the latest fashion trends and practicality. The west building sells carefully-selected high-quality Korean and overseas brand name products.